Getting a poster signed is harder than you think. As part of Gollancz’s wonderful advent calendar giveaway for Christmas 2015, I am delighted to be able to offer a very special prize of a Robot Overlords quad poster signed by myself, director Jon Wright, and some of our lovely cast including Craig Garner (Mediator 452), James Tarpey (Nathan), Ella Hunt (Alex) and Gillian bleedin’ blinkin’ flippin’ Anderson! Getting these signatures was no easy task. Jon, Ella and I attended the MCM Comic Con in Birmingham in March, and we signed a few for punters then, but they were all gone before I could grab a spare. And this was the first I had seen of the posters, which meant that when I was in the company of living legend Sir Ben Kingsley the previous week for his publicity stint, I didn’t have one for him to sign! I did get manage to get some for EasterCon in April, and clung on to the three I had left over with a cunning plan to get as many of the Robot Overlords stars to sign them over the coming year of cons and festivals. 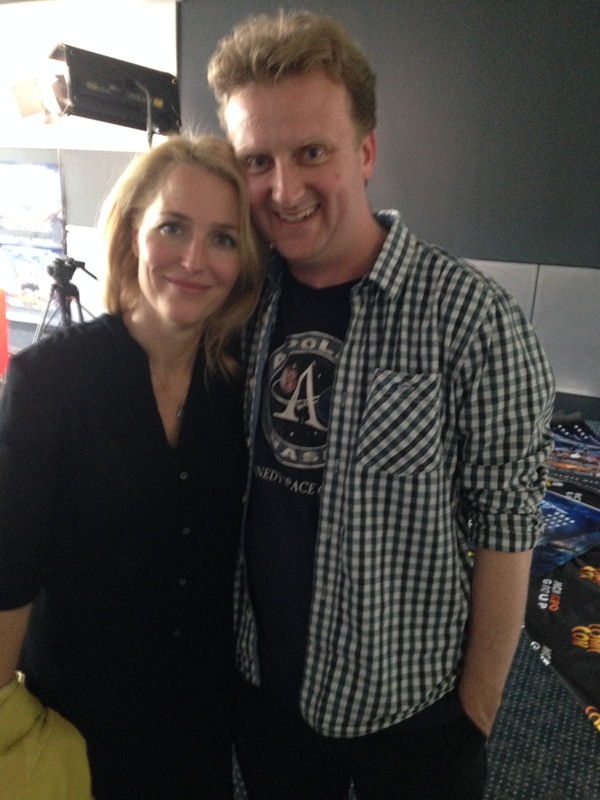 And then after that she was swept away for an interview with James for the DVD. By now, her car had its engine running (she was about to fly off to make something called The X-Files… you may have heard of it), and my window of opportunity was rapidly closing. … and then she was gone! I carefully rolled the posters into their tube… But I wanted more!! My other targets were Ella, Callan McAuliffe (Sean) and Milo Parker (Connor). But they were all off making other movies: Callan’s made five films since Robots, Milo was away with Gandalf making Mr. Holmes, and Ella had a big costume drama lined-up… But then it got bumped to next year! Her delay was my good fortune, and she kindly popped into the Gollancz offices where we put the world to rights over tea and brownies, and she signed the posters. So there you have it, fair reader. If you are the lucky winner of this poster, please bear in mind all the times I had to lug a poster tube on the underground, all the miles and miles of Sharpie ink, and all the nerves and tension wondering if I would get those rare signatures. Frame it, prostate yourself before it every morning, give it a dust every now and then, and then flog it when you’re old and grey and I’ve won all those Oscars. Posted on December 9, 2015 December 15, 2015 Categories Actors, Competition, Movie Posters, Robot OverlordsTags Callan McAuliffe, Competition, Craig Garner, EasterCon, Ella Hunt, Gillian Anderson, gollancz, James Tarpey, Jon Wright, mark stay, MCM Comic Con, Milo Parker, poster, robot overlords, signed, Sir Ben Kingsley1 Comment on Getting a poster signed is harder than you think. 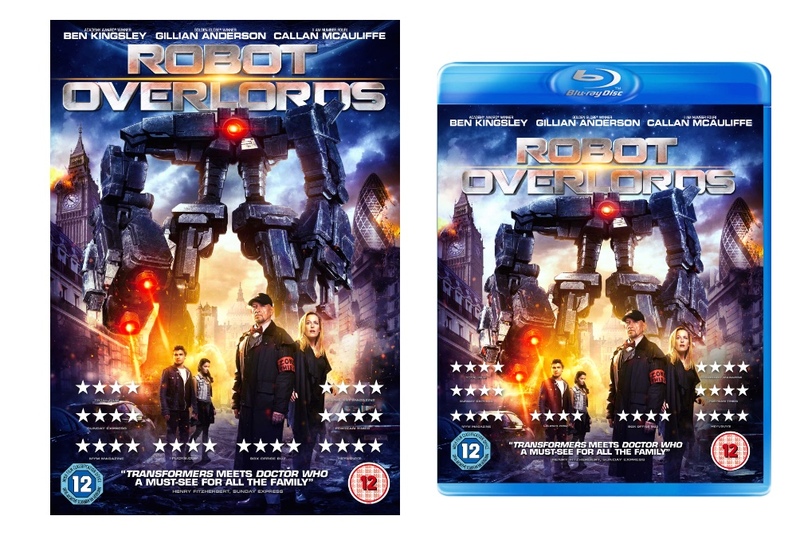 Posted on June 30, 2015 July 21, 2015 Categories Movies, Robot Overlords, UncategorizedTags Blu Ray, Callan McAuliffe, Craig Johnson, DVD, Ella Hunt, film, Gillian Anderson, James Tarpey, Jon Wright, mark stay, Mat Zo, Milo Parker, Reviews, robot overlords, Sir Ben Kingsley, Steelbook5 Comments on Robot Overlords – HD download, DVD and Blu-Ray coming soon! 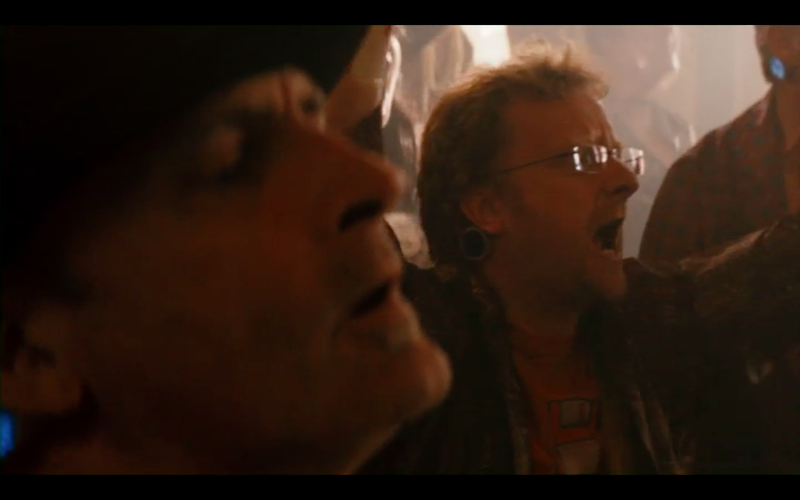 Robot Overlords invade America – UPDATE FOR DVD! 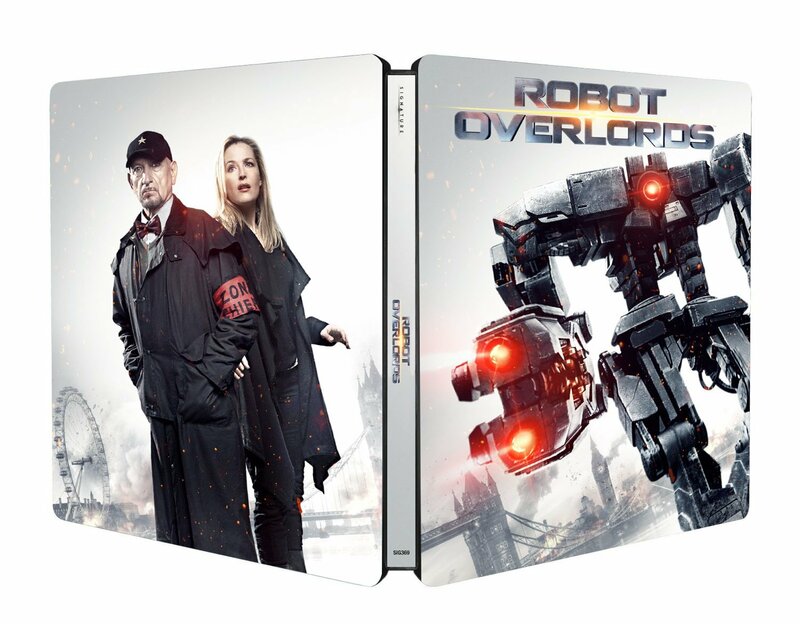 UPDATE: Just to add that ROBOT OVERLORDS is now available on DVD, including from your digital overlords at Amazon.com. A big thank you to everyone who has bought it so far, and a big, metallic robot hug to the wonderful people who left us ratings and reviews. The good ones really help us! 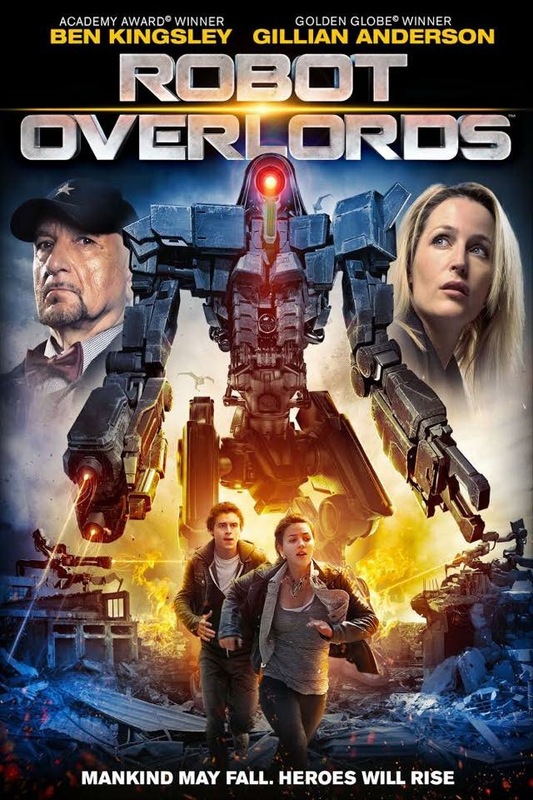 Posted on June 29, 2015 August 12, 2015 Categories Movies, Robot Overlords, UncategorizedTags American, Arizona, Callan McAuliffe, Craig Johnson, Ella Hunt, film, Gillian Anderson, James Tarpey, Jon Wright, mark stay, Mat Zo, Milo Parker, release, Reviews, robot overlords, Sir Ben Kingsley, Southfield, Steelbook, streaming, U.S., U.S.A., VOD1 Comment on Robot Overlords invade America – UPDATE FOR DVD! On 13th July 2010* I received an email from Director Jon Wright with the subject heading ‘Two page idea attached’. In it he outlined a movie idea that had come to him in a dream: a world where humanity had been defeated by an invading alien robot empire and everyone is ordered to stay inside their homes. Back then it was called OUR ROBOT OVERLORDS. Some of those ideas have survived through to the finished film, some have fallen by the wayside and others could still be used in potential sequels or TV series, but already the world felt strong enough to start bouncing ideas back and forth and start working on a script. 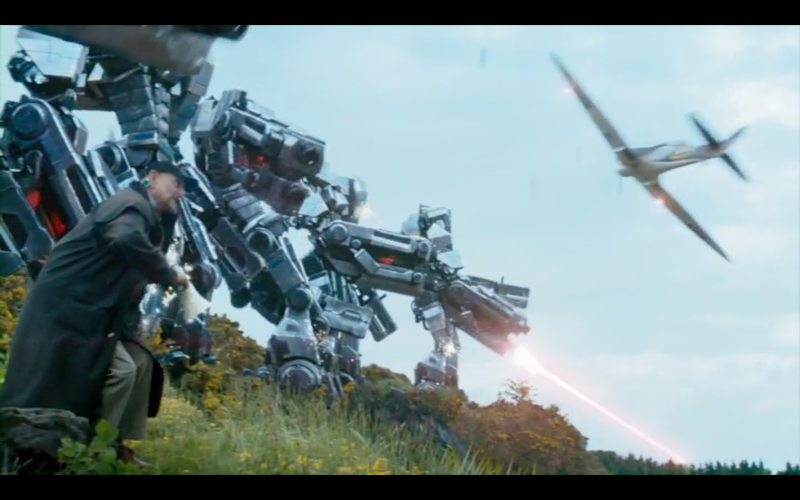 And so ROBOT OVERLORDS was born, and a mere four years, eight months and fourteen days later it’s in UK cinemas for the public to see. That’s pretty fast for an independent British movie. Jon and I met back in September 2006** when he became attached to a screenplay I’d written called WAITING FOR EDDIE (later EDDIE’S DEAD). We were introduced by a Producer called Dean Fisher who had optioned WFE and had got the project into the inaugural Film London Microwave scheme. Over the week of workshops and development we all bonded, but I knew I’d get on with Jon because when we first met in a Nero’s outside Liverpool Street Station, we banged heads as we sat down and were both too polite to say anything about it. We worked on developing a number of scripts over the following years while he made TORMENTED and GRABBERS, but ROBOT OVERLORDS is the first of our joint projects to get off the ground, and I have to admit that there are days where I feel like I’ve jumped the queue. Because what you’re supposed to do is make a mega low-budget horror or two and then you might be lucky enough to make the kind of science fiction adventure that you loved as a kid. 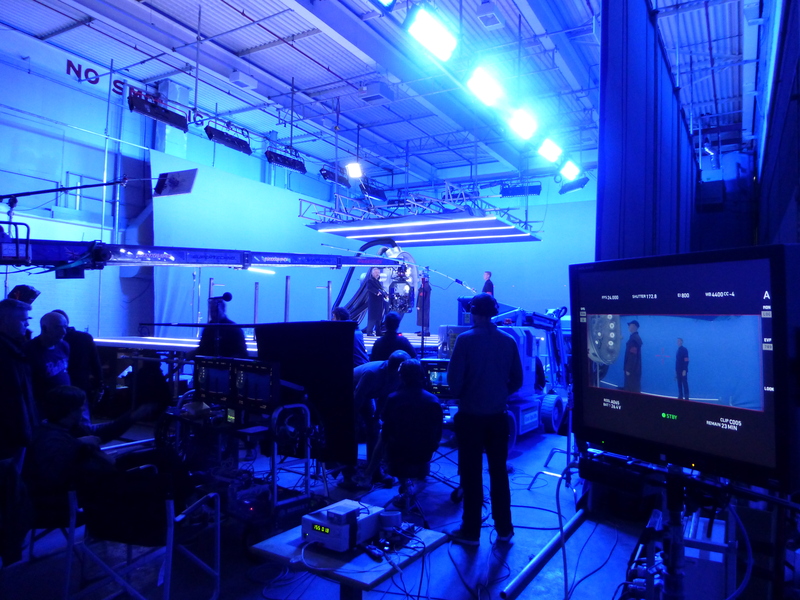 Felt a strange, other-worldly thrill at the first shout of “Action” on set. The first take… ruined by a bunch of us taking photos on our phones. 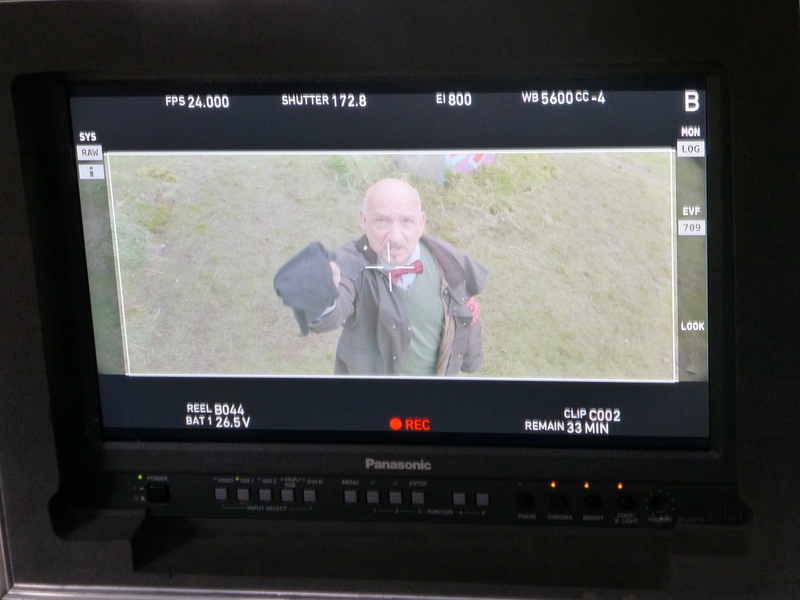 Watched actors of the calibre of Sir Ben Kingsley, Gillian Anderson, Geraldine James and many others take our words and bring them to life. SBK gives it his all. 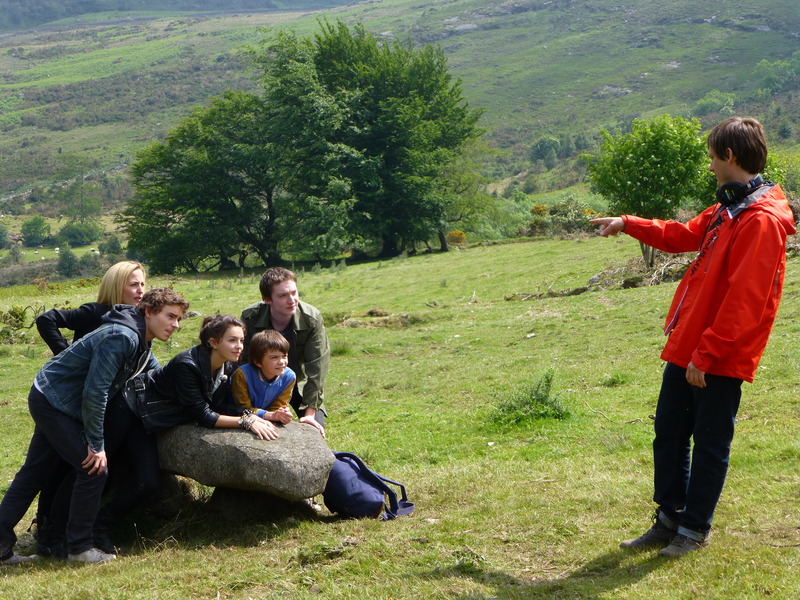 Not to mention watching our gang of heroes Callan, James, Ella and Milo genuinely become friends over the course of the shoot. 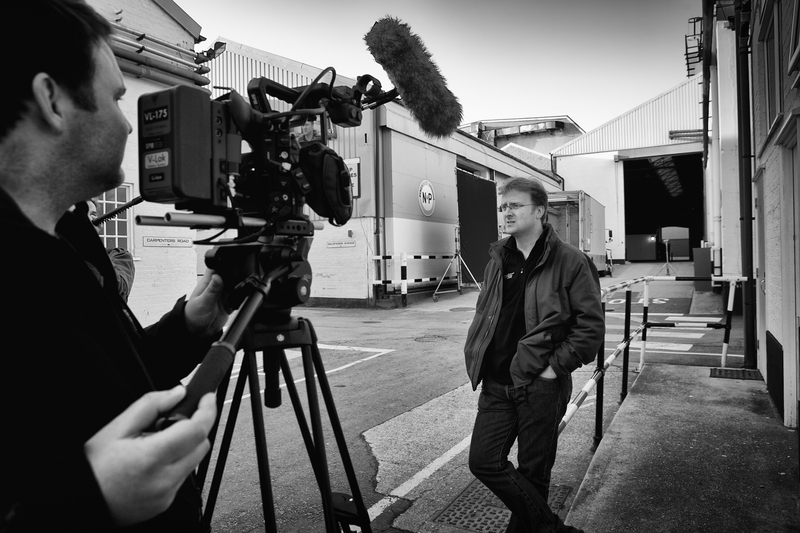 Strolled around Pinewood Studios like we owned the place. Author videos are so much cooler on the backlot of a major studio complex! 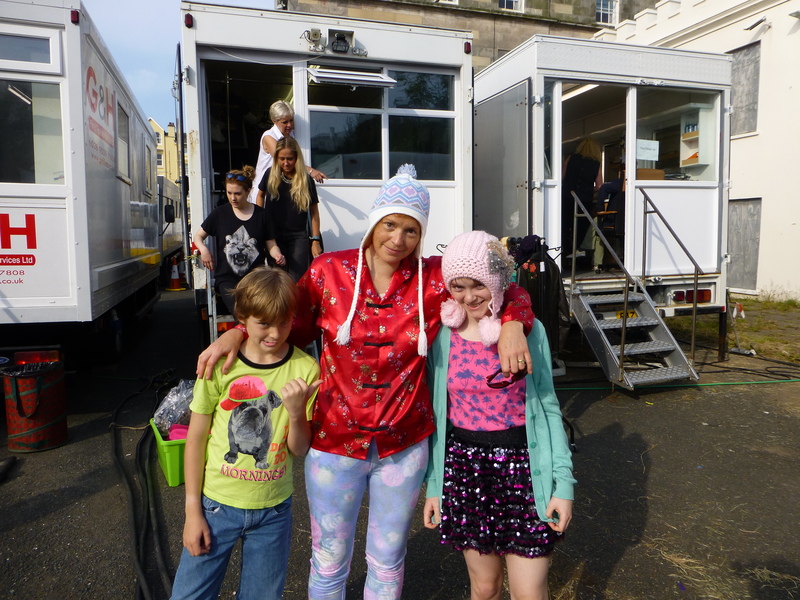 George, Claire and Emily in costume for our day as extras. Being thrilled as Nvizible took our ideas and came up with stuff like this! And then I got to write the novelisation (available now wherever books are sold)! I attended the premiere at the London Film Festival like a proper Z-list celeb! All the beautiful people at the LFF premiere… and me! 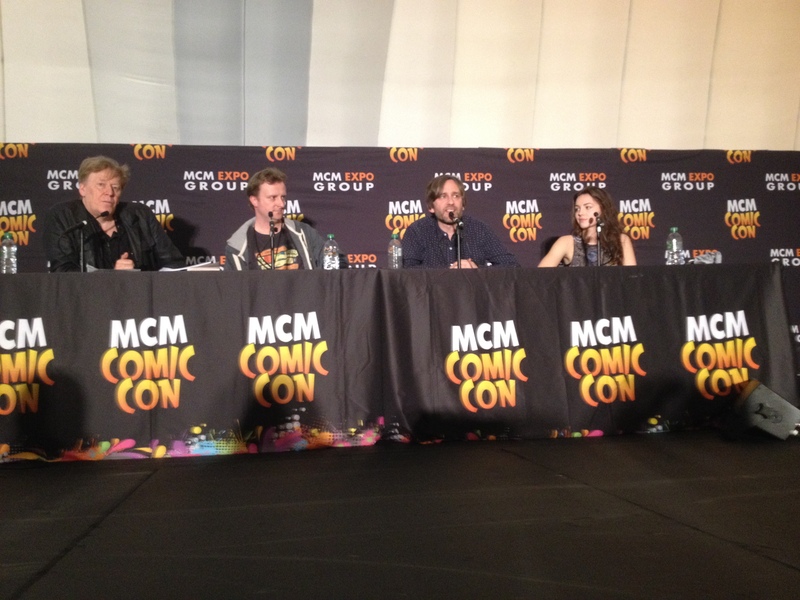 2000AD creator Pat Mills ran our panel! I’ve chronicled some of those events on this blog, and there’s a whole ‘shoot diary’ section in the book, and I’ll no doubt bore you with it some more over the years, but for a first film I could not have asked for a more incredible experience and I suspect I may never have it this good again. 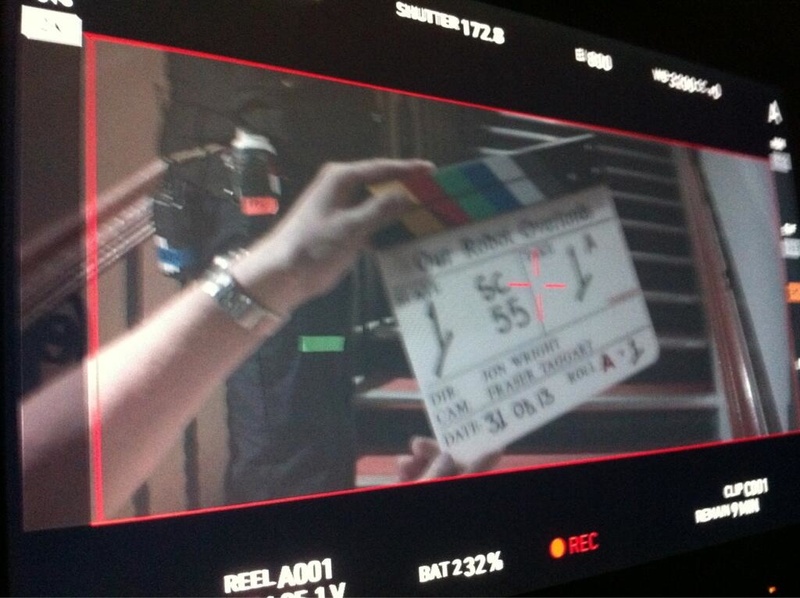 And now the film is now in the hands of the Great British Public. Some folk have expressed dismay that it’s not on everywhere, and we do indeed have a limited release, but that reflects the reality of British indie cinema distribution at the moment. And you only have to look at the box office returns of the last ambitious Brit Sci-Fi Film to see why some lesser distributors were nervous about taking us on. But our bold and pioneering independent distributor Signature have a very clear strategy for the film over the coming year, and this is only the beginning. I have faith that you’ll all get to see it one way or another, but if you can see it on the big screen then do please go: plenty of people worked very, very hard to make it look and sound so magnificent. *I keep a diary, so can very specific about dates. **1st September, since you’re asking.